Gambling is legal in France, and has quite a history in the country. France has contributed to the creation of several forms of gambling. The roulette wheel was invented by the French mathematician Blaise Pascal. The original version of baccarat, chemin de fer also originates from the country as well. Parimutuel betting, as the name suggests, also has French origins. The 52-card deck used today was also created in France, with the Queen replacing the Nobleman in the 1500s. Operating any sort of gambling establishment in France requires a licence. The regulations are not particularly strict, and they focus on keeping French gamblers from becoming addicted to the games. However, gambling taxes are rather high, forcing several operators out of the market. Gambling in France is not supervised by a single entity, but by several. Betting activities have traditionally been divided between the Pari Mutuel Hippodrome (PMH) and the Pari Mutuel Urbaine (PMU). The country’s national lottery, as well as some lottery-style games such as bingo, are in the hands of Francaise des Jeux (FDJ). Online gambling is regulated by the Autorité de régulation des jeux en ligne (ARJEL). Online casino operators may not receive a licence, as it is considered to be too addictive. Gambling taxes and licensing fees on top of the corporate tax rate make it difficult for online gambling operators to turn a profit in France. Unlicensed French operators may be heavily fined. However, players placing bets on international gambling websites are not prosecuted, though some of these may be blocked by ISPs and very few offshore casinos accept players from France. Casino gambling is legal and quite popular in France. 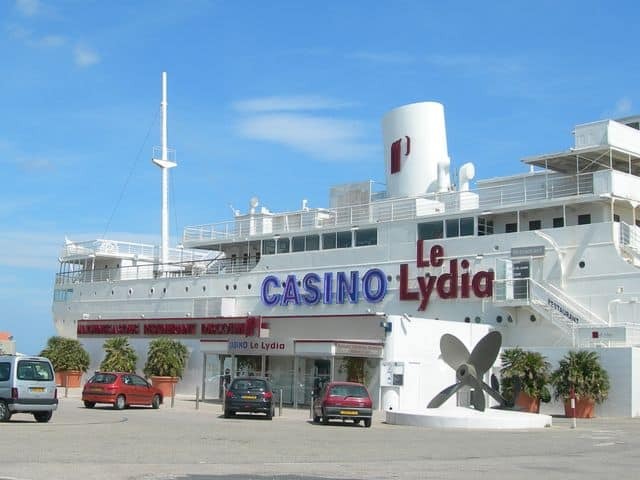 There are currently over 150 brick and mortar casinos in operation within the country, as well as a landlocked casino cruise ship, the Lydia, moored in the port of Barcarès. Casinos offer several table games including baccarat and poker. Slot machines, which have been legal since 1988 may also be found in these establishments. Though online gambling has been legal in France since 2010, online casino gambling is still prohibited, and no online gambling licences are issued to casino operators. The reason for this is that casino games are believed to be more addictive than other forms of gambling. However, locals playing on international online casino sites are not prosecuted, though very few accept players from France and these websites might be blocked by ISPs in the country. Bingo has been a popular game in France for several centuries. There are several bingo halls to be found within the country, often incorporated in bars and pool halls. The French version of bingo is somewhat different from the game known in the US, with the cards being rectangular instead of a square. Still, the basics of the game are the same. Online gambling was legalised in 2010, which included lottery style games such as bingo. However, licences for operating lotteries are not issued, as it is a monopoly of FDJ. There are 6 types of bingo games available on the website of FDJ. Locals may also play on international online bingo sites, though some of these may be unavailable and they rarely accept players from France. I can not recommend any bingo sites that would accept player from France right now. Poker is one of the most popular form of gambling in France. Live poker games and tournaments may be found in several brick and mortar casinos, though there are also dedicated poker clubs. One of the most prestigious poker tournaments in the country, the French Open takes place at the Casino Barrière. Online poker has been legal and regulated in France since 2010. Though poker is among the games generally played at casinos, it is considered a game of skill rather than luck, exempting it from the ban on online casino games. There are currently 15 gambling operators licensed to provide online poker services within the country. Currently, I can not recommend any poker website, that would accept players from France. Sports betting, especially horse race betting, has quite a tradition in France. Parimutuel betting, where the bets are pooled and then divided among the winners in accordance with the calculated odds, originates in France. To date the largest sports betting company in France is the PMU, which traditionally offered only horse race betting, but has since branched out towards other sports. Online sports betting is among the gambling activities that were legalised in 2010. Both PMU and FDJ offer online betting on horse races and various sports events. The most popular sport to bet on is, as in most of Europe, football. Online sports betting is not a monopoly in France, other companies may apply for and receive online sports betting licences as well. I can not recommend any online bookmaker, which accepts registrations from France currently. Lottery is legal in France, and it is the monopoly of FDJ, the operator of the French national lottery. Francaise des Jeux offers various lottery draws and lottery style games such as scratchcards and bingo. FDJ was the cofounder of the European lottery EuroMillions, along with the Spanish Loterías y Apuestas del Estado and UK’s Camelot. Online lottery is also legal in France and it is in the hands of FDJ – no other companies may receive a licence for providing online lottery games. All of FDJ’s games are available online, including the several types of scratchcards. There are also no laws against locals participating in any international online lottery draws available to them. Bitcoin gambling, and the use of Bitcoin in general is not specifically regulated by French laws. The use of the cryptocurrency is quite widespread within the country; there are Bitcoin ATMs as well as stores accepting it as payment. In accordance with French online gambling laws, online gambling services may only be provided with a licence. Also, online casino games are banned due to their addictive nature. As a result, there are no Bitcoin casinos licensed within France. However, there are no laws against locals playing in international Bitcoin casinos. Bitcoin casinos are not eligible for a license and the unlicensed Bitcoin casinos are best avoided. Therefore I can not recommend any. This online gambling guide focuses on the legal status of casinos, online gambling, sports betting, lottery, bingo, poker and Bitcoin gambling in France and its overseas territories. for cash prizes, do we have to have a gaming licence?